I usually limit the posts on our blog to background art from great artists and major studios, usually Disney. "The New Three Stooges" was animated at Cambria Studios, a small studio once located in West Hollywood. Despite operating on a shoestring budget, the studio was able to produce series which are fondly remembered for their imaginative and entertaining storylines, and for their inventive ways of compensating for budgetary limitations. Remember "Clutch Cargo?" The wildly successful TV screening of vintage Three Stooges shorts created a new children's audience desperate for more from the eye-poking trio. 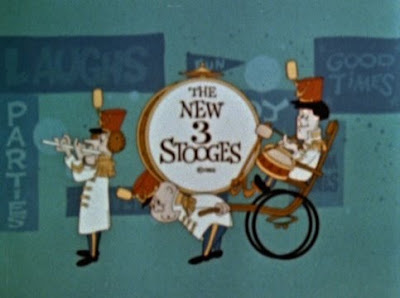 So "The New Three Stooges" was born, which featured new animated segments as well as live action vignettes by original stooges Moe Howard and Larry Fine along with third Stooge "Curly Joe." I had frankly forgotten I'd picked up a DVD of the series. When unpacking a box of DVDs after my recent move, I stumbled across this by accident. I was struck by the simple but eye-catching Old West design of this opening pan shot. It's lean but charismatic, don't you think? 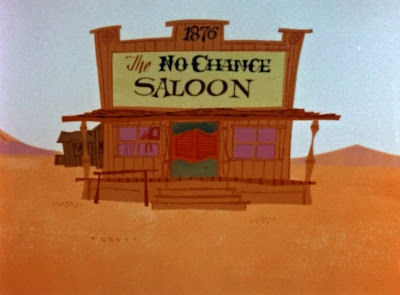 I have broken up the pan B/G into right and left sections, as well as the final frame of the "No Chance Saloon," so you can take a better look. Background artists for the series were Gloria Wood, Bob Inman and Bill Butler. Beautiful! Can you please post more of this?? I'm looking for more western cartoon backgrounds! Hey your blog is so nice, honestly I liked it. Well I want to tell you that I just watched the new movie "The Three stooges" and trust me guys I loved this movie. I think it is the best funniest movie of this year. This movie is the ultimate entertainment for all the viewers. You should watch the three stooges movie and I bet you will enjoy it.